@Firefish15, Gotcha! That's good advise, thanks much!! @Firefish15 @Clown79 - Finally set it up!! Woohoo!! Looking good. Can't wait to see the corals you choose. Haha, it's an exciting feeling isn't it? @Clown79, it's mostly going to be soft corals, since everything else is illegal. Hopefully I'll be able to get some great frags! @Firefish15 @Clown79 - My day # 3 parameters. Am I doing okay? Is there anything I should do differently? That looks pretty typical for a few days in. At this point, you just have to do water changes pretty frequently and let the bacteria do their work. If the tank gets a bad odor, do another water change. Especially since yours in on your nightstand. Keep the wife happy. Just don't add any livestock until the ammonia and nitrite are at 0. Did a 50% WC. Also got my new lights. I'm using LuminiGrow Asta20. Trust should be adequate. Here's how the tank looks now. ahhh its an ADA tank... i love ADA tanks... i have a 90p setup iwagumi style. Careful with that low iron glass and sand. 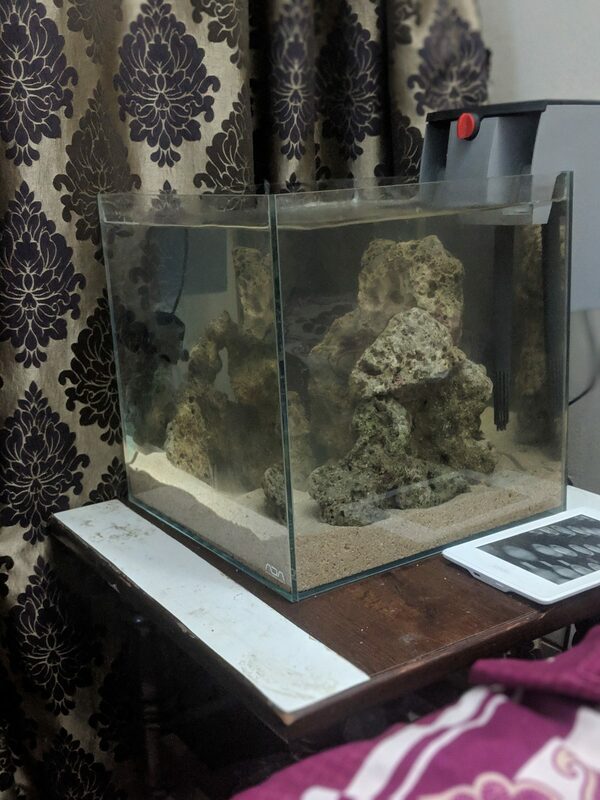 So again be super careful, sand is nothing like aquasoil your probably used to since ADA tanks are mostly seen in Iwagumi style setups. I was even considering using that 45-C you got there as my reef, but i got a hell of a deal on a Aquatop predrilled with sump. I am using a ADA Mini-M as my ATO topoff tank. Which my brother finds extremely wasteful, but it was just sitting there not in use. Anyhow just another friendly reminder to make absolutely sure you do not get sand on a magnetic scrapper, or scrubbing pad when you clean that algae off the glass. Its not even a will i scratch it, its a definite you will scratch it, and ruin that beautiful tank. Guys, here are my day#7 parameters. What the heck is going on? 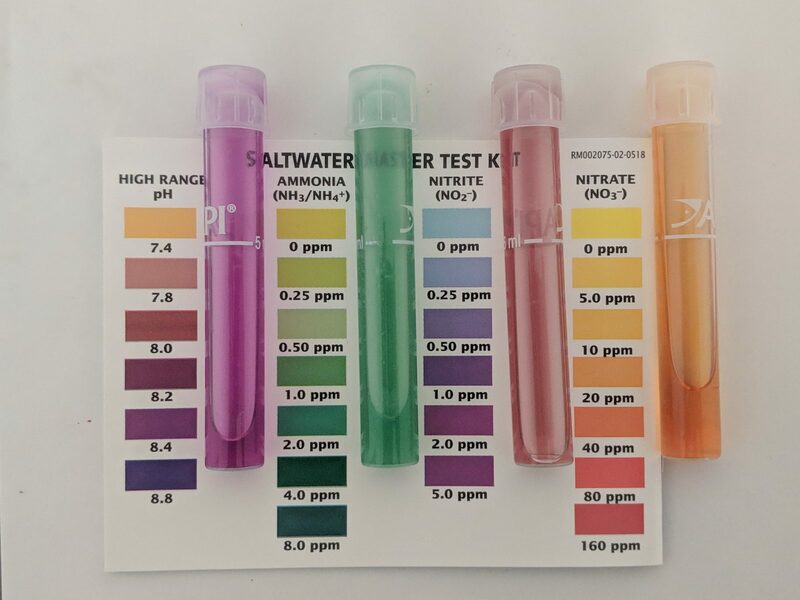 Why is my ammonia and nitrite so low? Is this normal? I did a 50% WC yesterday. Did I screw it up? Salinity is at 1.025. What do I do at this point? Do I add more ammonia? I add tetra bits as ammonia since it's a fishless cycle. 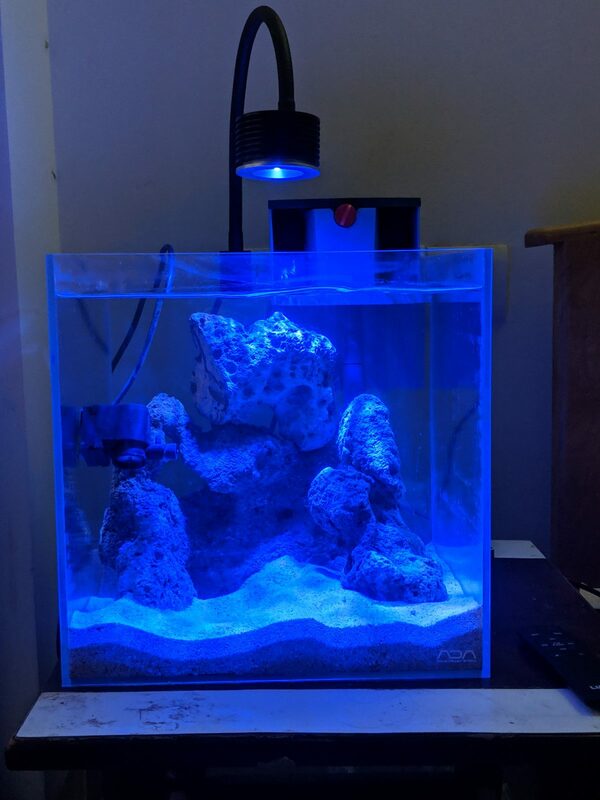 Im pretty sure cycling a freshwater and salt water is going to be similar, so my guess is you might of messed it up by the water change too early and too much of it at 50%. Typically your supposed to let it go without the water change, and then change the water when you get those values as you have the sufficient bacteria to handle the load. The water change basically got rid of the ammonia, and skewed your cycle. If im reading your thread correctly, you started last week. You should let the tank run without water change for at least 3-4 weeks. How did you start your cycle also? did you use the raw shrimp method? or ammonia drops? Firefish recommended you do weekly water change but this is completely new to me when your doing a cycle. As i said your trying to build bacteria, and you want the high ammonia concentration at start. Maybe a more experienced reefer can give you insights, i would ask Clown79, he seems like he knows his stuff pretty well, but again, if this was a freshwater tank, what i would do is restart the cycle by going either the raw shrimp in the tank for 2-3 days, or doing the ammonia drops. (fishless cycle) Unless you used live rock and live sand. If you used live rock and live sand, you can only do the waiting game now. And this time let it run without a water change for at least 3 weeks. 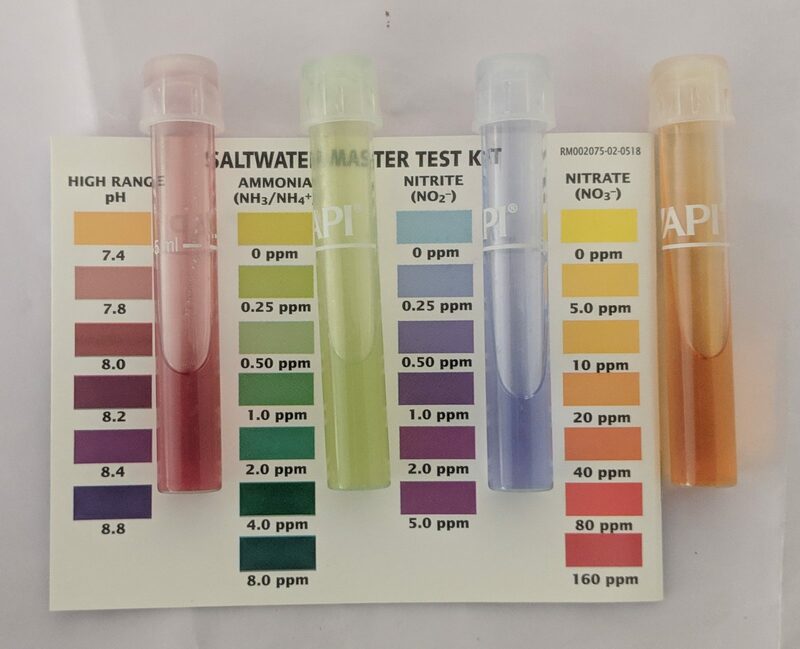 You should see a spike in ammonia, and then it will slowly go down, and once it hits 0.25 you can do your first water change, about 10-15% max, and then add fish when you see it hit 0. IF the tank does smell, you can use carbon... as it wont abosrb ammonia, but i would not leave it in too long... about 2-3 days tops, and then pull it out. Carbon will act as a biological media if left too long, and you do not want bacteria growing on your carbon vs your live rocks and sand. It will polish the water and clean the smell a bit tho, but it can also extend the time required for cycling. @Naekuh, I setup my tank on Sunday, Feb 17th and started the cycle immediately by adding tetra bits. I tested on Tuesday, Feb 19th and the parameters looked okay, you can scroll up and check my parameters. Then I did a 50% WC on Friday, Feb 22nd and checked my parameters today, i.e. Saturday, Feb 23rd. I am adding Seachem stability in the recommended doses everyday since I setup my tank. I'm also adding Seachem Prime every alternate day & Purple Up everyday. I'm assuming Purple Up won't impact my parameters, since it's basically calcium and alk and it's just to basically boost coraline algae. I suppressed an urge to add Seachem Purigen yesterday, since a couple of forums suggested it will mess my cycle. Should I add a small raw shrimp today? And then quit doing WC? Should I continue dosing stability, prime and purple up? Can you tag someone who might have a concrete answer and can guide me properly? Ask Clown79.... ive been following his posts and he seems pretty knowledgeable from the people who have posted in your thread. I am fairly sure the 50% water change is what dropped your values too quickly and might of skewed your cycle. I have never heard of a tank being able to cycle that fast unless its using a lot of live rock + live sand + a pre seeded biological matrix like marinepure / seachem matrix. Since u have no live stock, it wont hurt restarting your cycle, and you only lost a week at most. And yes do not use purigen. I have a lot of experience with purigen, its great stuff for keeping your water clean by removing nitrogenous waste, so it will tear up your cycle. As i said if it smells bad, you can use carbon, it wont hurt your cycle much, but dont leave it in too long. Sure, I'm tagging @Clown79. Hopefully he'll respond. 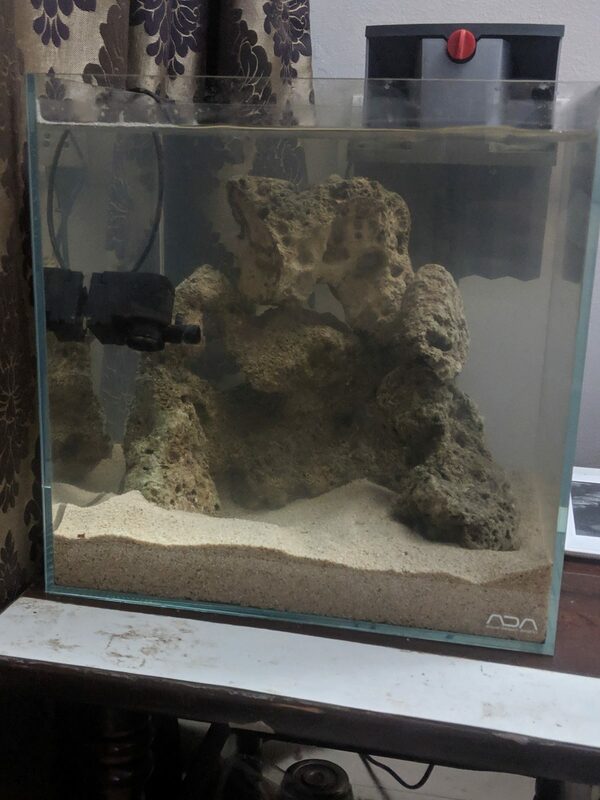 I did use live rock (it had traces of Coralinr when I bought it), live sand (or so the seller claimed) and stability. Live rock and live sand is a grey area here in India. Some people say it's illegal, some say it's not. I tried finding material on what's legal exactly, but I didn't find anything that was official, just banter on the forums. I'll wait for Clown79 to pitch in. Just let the tank cycle and do a large waterchange when the cycle is done. Liverock cycling goes quickly if the rock is in good shape, the more material decaying on the rock, the more detritus on it, the longer the cycle because ammonia levels are higher and take time to process. The waterchanges reduced the levels. That doesn't mean the cycle will not occur. I would just stop doing them. You want ammonia 0, nitrate, 0 and then do a large waterchange to reduce the nitrate levels. I wouldn't dose purple up at all. Why are you using prime? It's only used if you are using tap water(not advised fir various reasons) or have a spike while fish are in the tank. Most test kits cannot read proper ammonia levels when Prime is used. Only the seachem kit(and similar kits)and the seachem ammonia badge will read ammonia accurately while using Prime. Otherwise your readings will be inaccurate for 48hrs within dosing Prime.